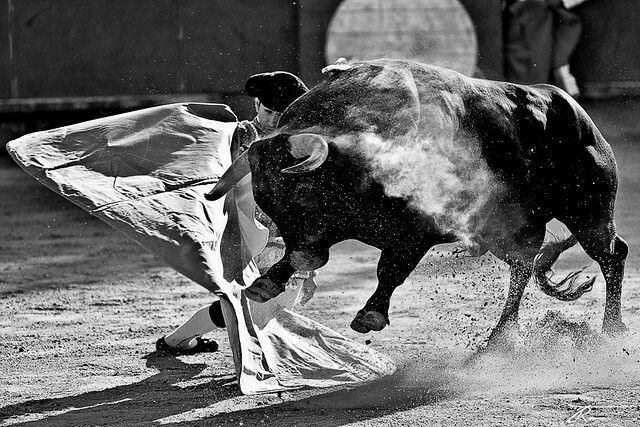 Ah… about Bullfighting at San Isidro.. 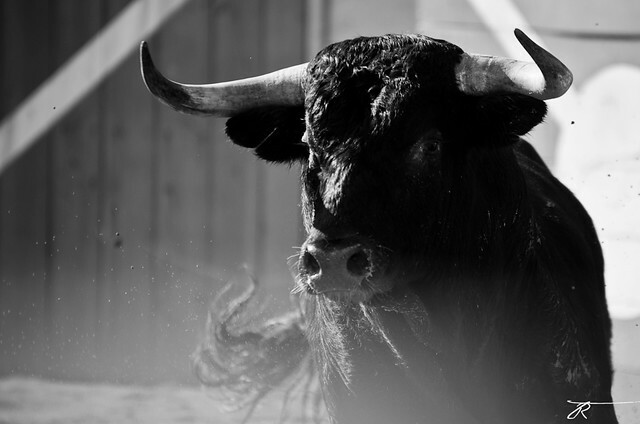 I will let my buddy Sue, a writer who lives in Barcelona, tell you more about it, in today’s guestpost, right here..
A fight between man and a weakened, enraged bull can never be a fair fight. Were he not drained of blood and strength prior to the actual fight with the torero (bullfighter), by lancers followed in the second phase by three banderillas who each attempt to plant two barbed sticks each in the bull’s shoulders, there would be no bullfighting at all. For a bull weighs up to 600kg – sheer muscle and sinew – and is a lethal beast. This “art form” prevails in Mexico, Portugal, the south of France and many Central and South American countries, apart from Spain (it is banned in Catalonia). It’s easy to vilify bullfighting, as an editorial in The Boston Globe did on the 27 of May”. And it seems to be a tradition on the wane, with less than 9 per cent of Spaniards saying they attend bullfights at all. 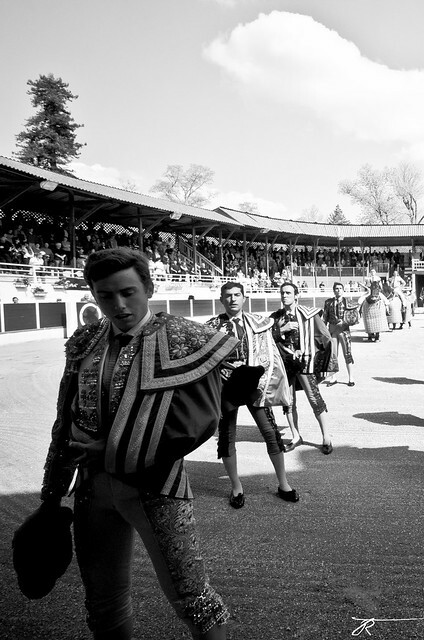 The Feria de San Isidro 2013 (which lasts from the 9th of May till the 2nd of June) in Madrid, is the most prestigious bullfighting event in the world. Novices and veterans from all over come here to test their mettle. Some, who play to the crowd with flamboyance, but who achieve to kill their bulls with sloppy moves, are derided by purists who would rather such bullfighters not be granted honours befitting grand masters. Others make it a veritable art – edging on the bull with intricate passes with their cape, done with clean, successive movements. Though executed with bravado and elegance as the bull charges dead on toward the torero, a split second of misjudgment results in a goring. Such was the fate of José Ramón García ‘Chechu’, who, during the 18th bullfight with toros (bulls) of Montealto marked by bleak moments with occasional wind and rain, was thrown in the air by the bull, causing a wound of 25 cm in the back thigh. 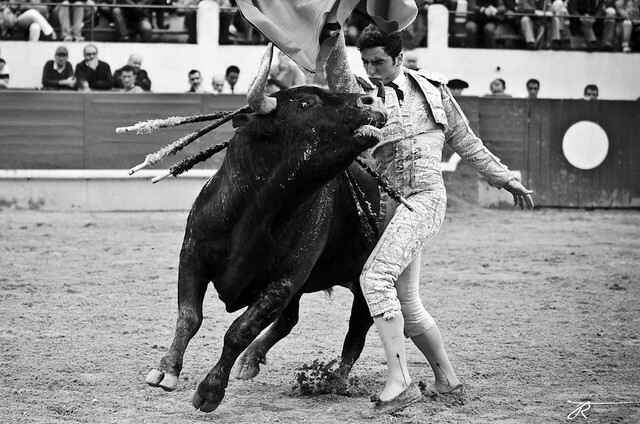 Alberto Aguilar, who substituted Fernando Cruz, faced an unpredictable first bull: just as Alberto was aiming to thrust his sword between the shoulder blades and into the aorta or heart of the beast – the moment in which man is most vulnerable – it lunged at him and missed Alberto by inches. 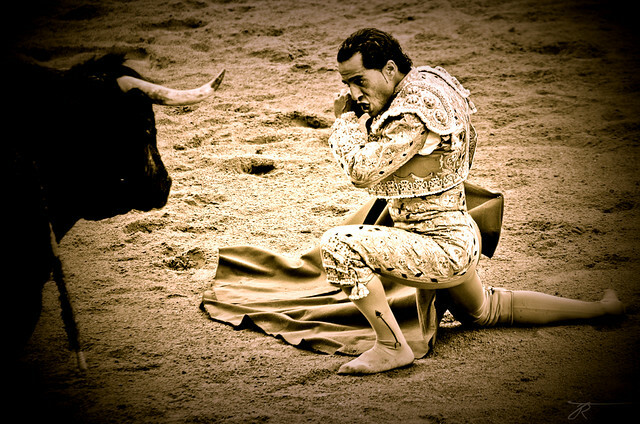 Manolete, considered the greatest bullfighter of all time, was known for his nerve and ability to stand very still while passing the bull close to his body. “His style was sober and serious, with few concessions to the gallery.” He died following a goring in his right upper leg as he killed the fifth bull of the day. 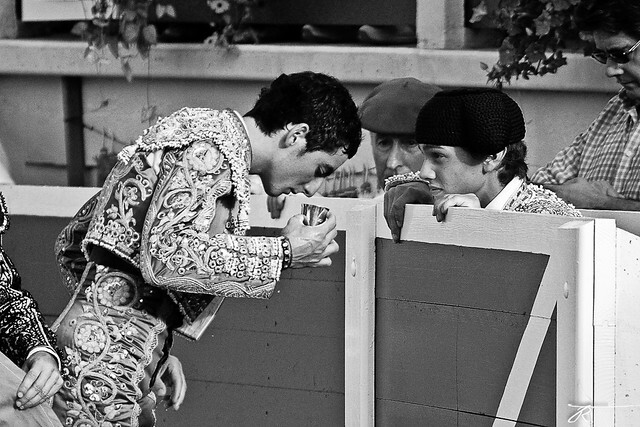 Mortal risks remain, and the bullfighting arena has a specialist surgeon onsite to conduct emergency operations. A priest is also at hand to give the last rites to those who need it. 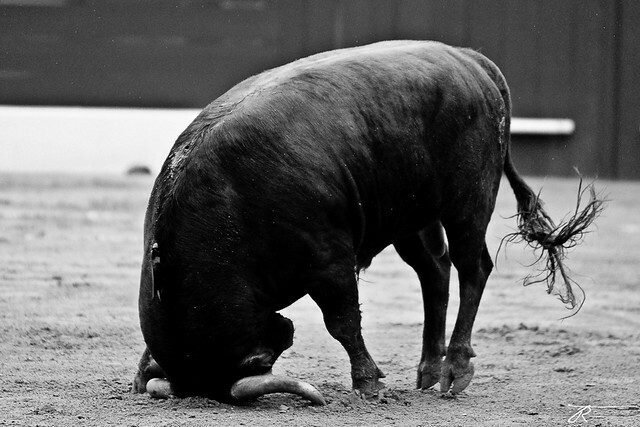 I remember watching a bullfight live almost 20 years ago and feeling bad to see the bull being weakened in two prior stages before the actual bullfight. The only way in which a beast with a powerfully built neck and shoulders will lower himself is through the progressive weakening of those muscles. I will never go to a bullfight again, but feel less able to pass judgment now on those who love it. There is no doubt about it: this dance with Death, played out with pomp and ceremony, is still a lavish spectacle. 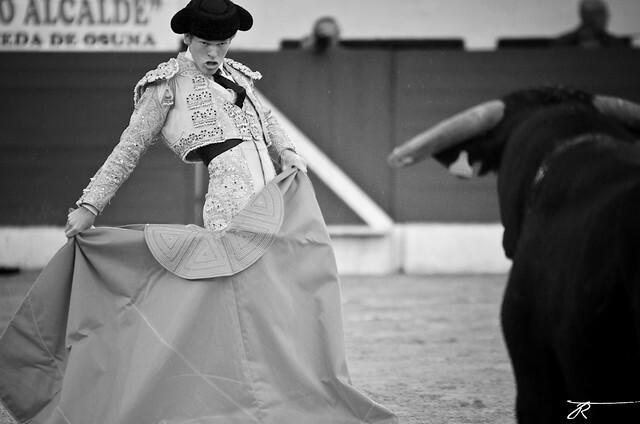 The sartorial splendor of the traje de luces (suit of lights) worn by a bullfighter is such that it takes 150 hours to sew the elaborate and amazingly sturdy attire resplendent with sequins and reflective threads of gold or silver by hand. Santos Garcia, one of the bullfighting world’s star tailors, told EFEstilo [correct spelling]: “The outfits must fit a bullfighter like a glove.” Bullfighting outfits, which are made to last 20 or 30 years, are usually worn only “two or three times” by their original owner, Garcia said, such is the rigour of the fight. 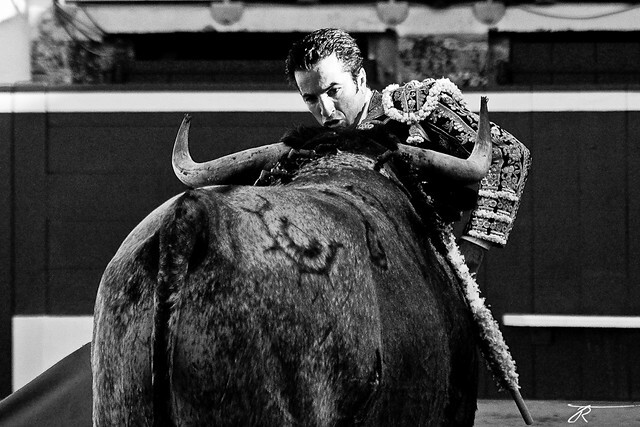 For all the beauty, savagery, and drama of raw emotions felt in the bullring, bullfighting – a tradition which dates back to antiquity – is something which will continue to spark unfathomable passions in man. It was an especially tough piece to write, presenting bullfighting as it is: without a simple pro or con stance. Having watched it live once ages ago, I did not know the history nor context of an ‘art form’ that stretches us to the extreme mentally and emotionally. I’ve been all over Spain and never gone to a bull fight. I must admit the last time I was in Spain, a new Spanish friend convinced me of doing it (although I never did). A lot of Spanish people I met are against it, but they still respect it. I feel like it’s a contradiction of emotions. And because so, well worth seeing for myself. I would love to watch one too. I guess I would have mixed feelings especially right at the end. Man or bull? Tough fight. I especially love the costumes! 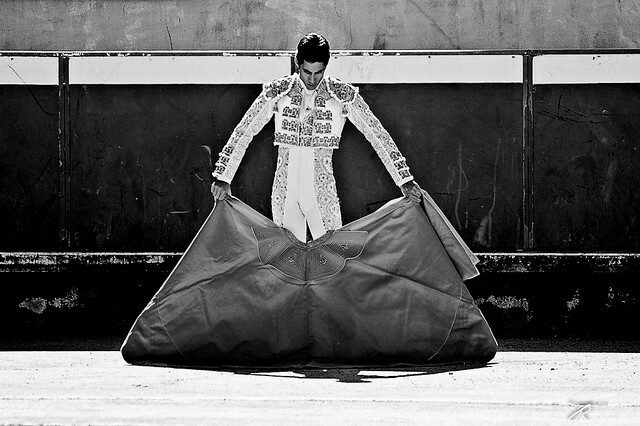 I agree.. Matadors are just so handsome.. so tragic.. sigh..